The Best Marketing Podcasts from thousands of Marketing Podcasts on the web using search and social metrics. Subscribe to these audio podcasts because they are actively working to educate, inspire, and empower their readers with frequent updates and high-quality episodes. Marketing Podcast newsletter is a comprehensive summary of the day's most important audio podcasts episodes from the best podcasters on the web, and delivered to your email inbox each morning. To subscribe, simply provide us with your email address. Hoboken NJ About Podcast In the Marketing Mentor podcast, Ilise Benun, founder of Marketing-Mentor.com, offers short but meaty conversational interviews with creative professionals who are doing what it takes to stop feast or famine, get better clients and command the fees they deserve – and sharing what they’ve learned. Facebook fans 1,733. Twitter followers 22,795. About Podcast This is the podcast for ideas and inspiration on marketing your business and growing your business, and for discussing topics on all things finance. Each week you'll hear interviews with business experts, marketers, entrepreneurs and journalists. Interviews to listen to in the car, on the train or on the treadmill. We talk about: How you can grow your business using content marketing and social media, How you can keep your Marketing strategy and communications simple and much more. Eagle, ID About Podcast Marketing secrets podcast episodes for online marketers. Russell Brunson's podcasts on Invisible marketing techniques, success secrets, self growth & income. Facebook fans 560,302. Twitter followers 28,859. About Podcast Marketing School brings you 10 minutes of actionable marketing advice every single day. Get the right tips to take your business to the next level and get to work right away. Facebook fans n/a. Twitter followers 10,460. Dunks in Natick, MA About Podcast A weekly marketing podcast about old and new marketing, plus your questions answered. Facebook fans 908. Twitter followers 515. San Diego About Podcast Amy Porterfield is a marketing strategist helping entrepreneurs build their business online. Facebook fans 278,070. Twitter followers 152,423. About Podcast B2B Growth is a podcast dedicated to helping B2B marketing leaders achieve explosive growth. Each episode features an interview with a B2B marketing executive or thought leader, discussing topics like: B2B marketing strategy, account-based marketing (ABM), content marketing, marketing technology (MarTech), B2B strategic partnerships, aligning marketing with sales, social media, content creation and promotion, leadership, buyer personas, agile marketing, and more. Facebook fans 319. Twitter followers 23,292. Melbourne, Australia About Podcast Welcome to ProBlogger, the home for those wanting to start a blog, create great content and grow their blogs and then go professional to make money blogging. Facebook fans 96,526. Twitter followers 237,326. About Podcast The Marketing Book podcast helps business owners and marketers keep up with the smartest thinking in the quickly changing field of modern marketing. Each episode interviews authors and marketers to give you actionable marketing insights, tips, tactics and resources to help grow your business. San Diego, California About Podcast Learn how to build an online business using smart passive income. Find Pat's podcasts, tutorials, videos, and other how-to articles on growing your business. Facebook fans 156,522. Twitter followers 153,784. London, England About Podcast The Sophisticated Marketer’s Podcast is hosted by Jason Miller, Sr. Content Marketing Manager leading global content for LinkedIn Marketing Solutions. Every two weeks Jason interviews marketing powerhouses from around the globe to bring you bleeding edge insights. He tackles the latest trends and topics that matter most to marketers and ties it all together with his unique rock ’n' roll flare. No fluff or frills, just real marketers talking about what matters most. Facebook fans n/a. Twitter followers 26,997. UK About Podcast 2X eCommerce is led by Kunle Campbell; an ecommerce marketing expert and business advisor to ambitious online retailers seeking rapid online sales growth. Facebook fans 466. Twitter followers 9,075. About Podcast Copyblogger FM is ideal if one is looking to improve their public relations writing. The weekly episodes feature trends and offer advice on topics such as content marketing, simple storytelling and SEO. Facebook fans 14,767. Twitter followers 4,740. About Podcast The Internet Marketing Podcast hosts the world's top marketers who reveal their latest growth strategies & advice. Listen here. Facebook fans 600. Twitter followers 4,866. About Podcast The Brainfluence Podcast features discussions with the world's top persuasion, influence, and psychology experts. Facebook fans 10,404. Twitter followers 46,253. About Podcast Everyone Hates Marketers is a no-fluff, actionable marketing podcast to help you stand out from the crowd and sell more stuffs, without shady, in-your-face marketing. Facebook fans 367. Twitter followers 306. Austin, TX About Podcast The Real Fast Results is a business podcast for people who want to see real results in their business fast. The show provides actionable, implementable steps in each episode. The focus is definitely on marketing strategies and list building with an emphasis on little-known but effective tactics. We also will cover passive and recurring income opportunities as well as productivity and time efficiency strategies for the busy and often distracted entrepreneur or content creator. Facebook fans 190. Twitter followers 2,528. Nashville, TN About Podcast Turn your expert knowledge into income, build authority, and deliver your message in a way that makes impact. RED will help you reach more people and make more money. Facebook fans 2,672. Twitter followers 939. About Podcast The Novel Marketing Podcast is a show for novelists who don't love book promotion but still want to become bestselling authors. Facebook fans 281. Twitter followers 132. About Podcast Marketing Speak is a podcast in which thought leaders and professional speakers weigh in on important marketing-related issues. A Podcast about Online Marketing, Ecommerce, SEO, Analytics, Facebook Advertising, PPC, and more. Marketing Speak will take you marketing to the next level - tune in for the latest tips, tricks, and practical advice from though leaders in the SEO and digital marketing world. Facebook fans 292. Twitter followers 254. United States About Podcast Alan Hart, host of Marketing Today, goes behind the scenes with the world’s best marketers and business leaders. Listen in to learn from the best of the best. What makes a great brand, marketing campaign, or turnaround. Learn from the stories of these great leaders and how you can unleash your potential. About Podcast Fabienne Raphael helps you to transit from Corporate to Entrepreneur throught this podcast. Greater Washington, D.C. About Podcast Spiral Marketing Agency, Consultancy, and Podcast helps Businesses and Associations to Elevate their Brands with 15 Years of Expertise Managed by Karl Boehm. Facebook fans 208. Twitter followers 89. Wales, United Kingdom About Podcast The Marketing Buzzword Podcast is the podcast that marketers didn't know they needed until they tuned in. Each episode is focussed on a specific marketing keyword or phrase that may or may not be used properly, or even make sense. The Marketing Buzzword Podcast aims to clear up these words and phrases, and truly unpick and understand what they mean, and how marketers can practically use them. Facebook fans n/a. Twitter followers 4,381. About Podcast This is the place where you’ll learn how to become a prolific online influencer, attract more ideal clients and grow your practice. About Podcast The Product Marketing Podcast for product marketers, merchendisers and PIM professionals. About Podcast Motivation Plus Marketing is the number 1 success motivation and marketing podcast in the world where a High End Business Consultant, Strategic Business Coach, Elite Speaker and Accomplished Author host the show. Facebook fans n/a. Twitter followers 8,324. NYC, NY · HFX, NS About Podcast Not a Real Job is a podcast about digital marketing, social media, website design, growth hacking, and more. It's hosted by Joel Kelly and Chris Van Patten, long-time friends and (self-proclaimed) digital pros. Sometimes the show is serious, usually it's hilarious, and it's always informative. Facebook fans n/a. Twitter followers 277. About Podcast Amanda Milligan, the branded content manager at Fractl, answers your questions about content marketing and digital PR. Episodes air weekly and are jam-packed with actionable advice sure to help you optimize your marketing efforts. 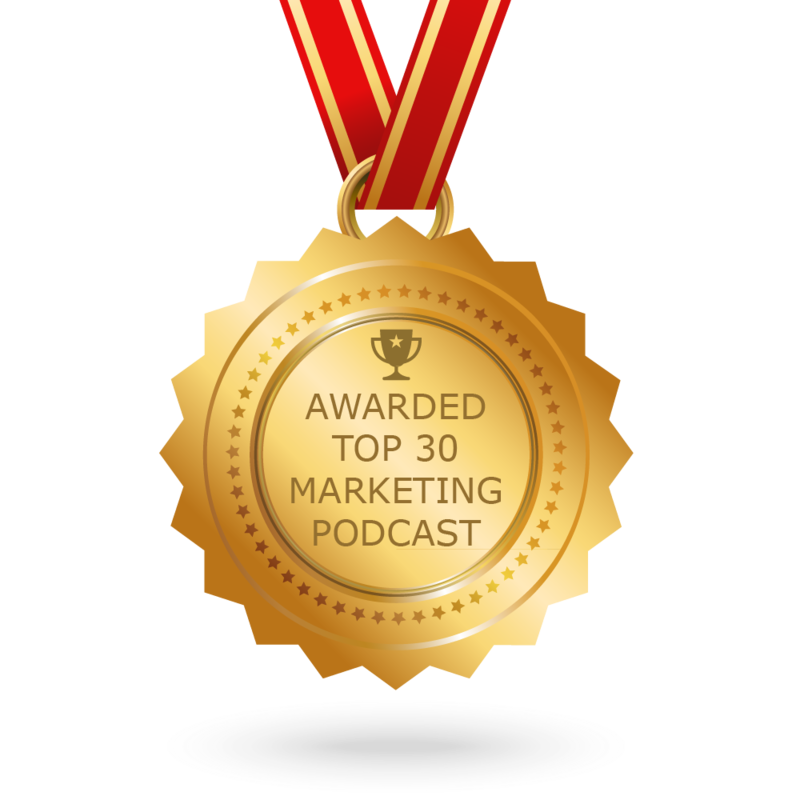 CONGRATULATIONS to every podcast that has made this Top Marketing Podcasts list! This is the most comprehensive list of best Marketing Podcasts on the internet and I’m honoured to have you as part of this! I personally give you a high-five and want to thank you for your contribution to this world.